The mayor's proposal to provide dedicated parking spots and garages for uniformed officers would cost taxpayers millions. So much for the long-awaited placard crackdown! Mayor de Blasio announced on Thursday that the city won’t reduce the number of city-issued parking passes — in fact, the mayor’s plan for solving the intractable placard parking crisis calls for the expenditure of millions of taxpayer dollars to build or lease parking lots for tens of thousands of police officers and firefighters who currently park wherever they want with their city-issued windshield passes. 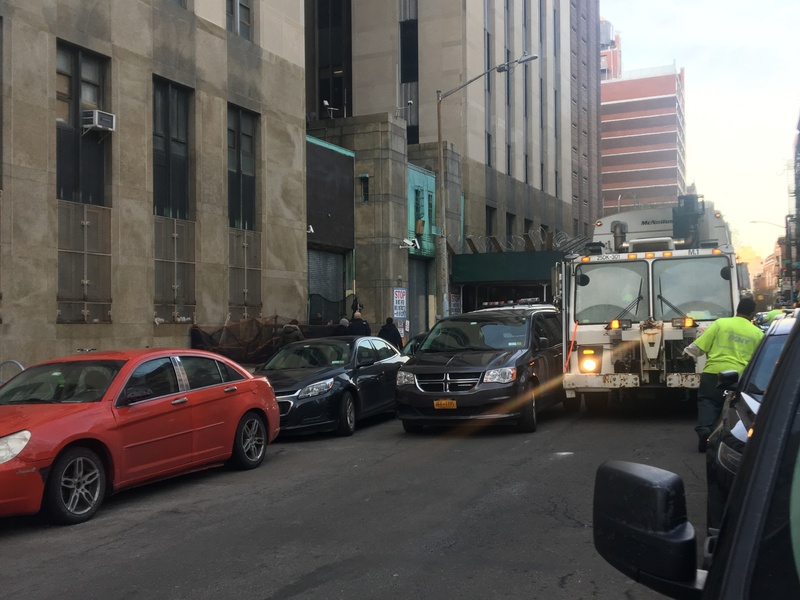 Even as rampant illegal parking by government employees harms public safety, exacerbates congestion, and betrays public trust, de Blasio’s concern appeared to be limited to the prevalence of untold numbers of fraudulent permits. Speaking to reporters in placard-plagued Chinatown on Thursday afternoon, he lambasted illegal placard parkers, but played down the inherent inequity baked into the existence of placards, which allow 125,000-140,000 city cops, firefighters, teachers and other public employees to have a place to park their cars when they drive to their jobs. Pressed by Streetsblog on the logic behind that proposal, the mayor argued that uniformed officers are owed parking privileges unavailable to the rest of the city’s residents. The mayor could, of course, pay city workers more or require them to live within the five boroughs, but, instead, he championed their supposed need for free parking at their workplace — a privilege that allows them to live differently, and farther from, the people they serve. Not entirely different. Across the city, public officials and imposters get away with illegal and unsafe parking in front of fire hydrants and crosswalks, in bike lanes and bus lanes — and even on sidewalks — all thanks to parking placards, which are distributed in the tens of thousands. 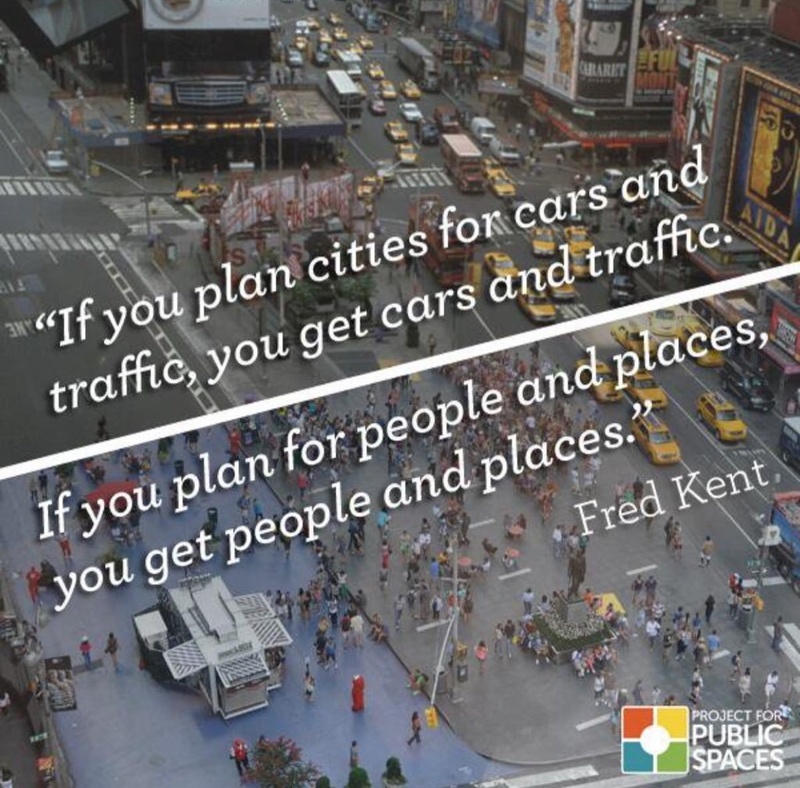 In the last three years, however, a growing chorus of citizen watchdogs, media outlets, and elected officials have bemoaned the over-proliferation of placards and their impact on both public safety and traffic congestion. Creating a paltry 10-agent unit at the Department of Transportation dedicated to enforcing illegal placard parking in known hotspots such as Lower Manhattan and Downtown Brooklyn. Imposing a three-strikes-and-you’re-out rule on placard-holders, revoking the placard if a recipient is found illegally parked three times. Creating a $250 penalty for illegally parking with a placard, though the city believes will require authorization from Albany. Initiating a “placard census,” focused on fraudulent placards and executed by the mayor’s Street Conditions Observation Unit. Simultaneously, DOT is testing out barcode-adorned placards, which should be harder to forge and impossible to transfer from one vehicle to another. In the longer term, by 2021, the city hopes to harness license-plate-recognition technology for all city parking spots. That tech will allow traffic enforcement agents to determine whether placards are actually being used for specific office business, or just to ensure a parking spot at work or the grocery store, according to Deputy Mayor Laura Anglin, who gave few details when pressed whether enforcement agents would still be able to look the other way at their placard-abusing fellow officers — a common problem today. The $52-million system will “eventually link parking meters, hand-held enforcement devices and license plates,” the city said in an accompanying statement. People who steal parking and public property: "no choice." One major flaw in the mayor’s announcement? Placards issued by state and federal agencies were not addressed. In fact, the city doesn’t even know how many of those placards are in circulation. DOT claims the total number of parking placards — including handicapped placards and placards issued by DOT, NYPD, and the Board of Education — is 125,500. Multiple federal and state agencies — federal courts, the Federal Reserve, the State Attorney General’s office, the MTA, etc. etc. etc — issue placards that the city does not control. Those agencies get DOT-issued signs setting aside curbside space for authorized vehicles — but it’s anyone’s guess who does the authorizing. The largest problem? The city has no intention of curtailing the continued expansion of the parking placard regime, which contributes heavily to its growing congestion problems. Government workers are less likely than other city residents to own cars, but have become more likely to commute by car into the Central Business District of Manhattan because of their placard-guaranteed parking privileges. And nothing in the mayor’s announcement Thursday will change that. In fact, he’s only going to make it easier for city workers to use their cars to get to work. 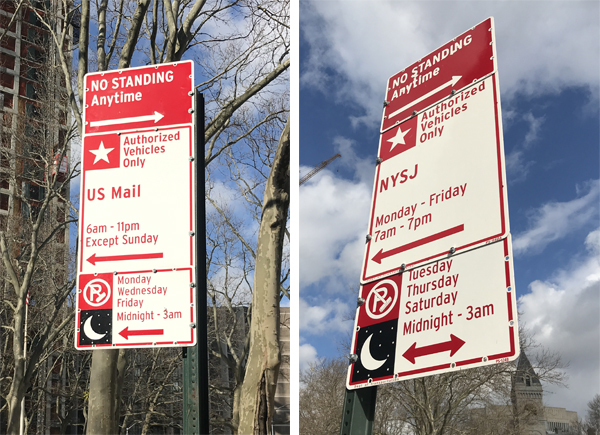 In anticipating of the mayor’s announcement, Streetsblog reviewed the history of placard abuse, and offered tips from other cities. Perhaps the mayor should read it. Ugh. Disappointing, but not surprising. The simplest solution: no placards for anyone. If you really, really couldn’t find a legal parking space and it was an emergency? Like someone was bleeding, that kind of emergency? Then fight the ticket afterwards. Anything else is just a recipe for corruption. One thing that’s not clear to me: how will the new system know if someone is using a placard for official business or not? I get that it will know if the vehicle is in the type of parking spot their placard allows, but how will the system be able to distinguish between a person who’s on the job doing official business and a person who’s, say, using a placard to score free parking while dining at a restaurant or going to the movies? The system would have to be so detailed that not only could it match a placard to a license plate of a specific police officer or city employee, it could also match things up to the hours and/or assignment a person is working. Seems unlikely it would be that fine grained. If anyone knows, please chime in, but I fear this is won’t move the dial on abuse all that much. I dont see how do David could say it wouldn’t be entirely different if people actually used their placards correctly. The issue is that people abuse their placards. Especially cops and fire fighters. If people with placards only parked legally with those placards, it would be very different. I’m a teacher – the teachers at my school park in front of the school in designated on-street spaces and we usually have a space or two to spare in front because it is fairly easily accessible by public transportation, so it is mostly only teachers who live in Rockland, Nassau, or eastern Queens that drive. On our street, there are no issues with DOE permits. But, there are people who park in our spots with other placards – police, fire, or my favorite, the local hospital. 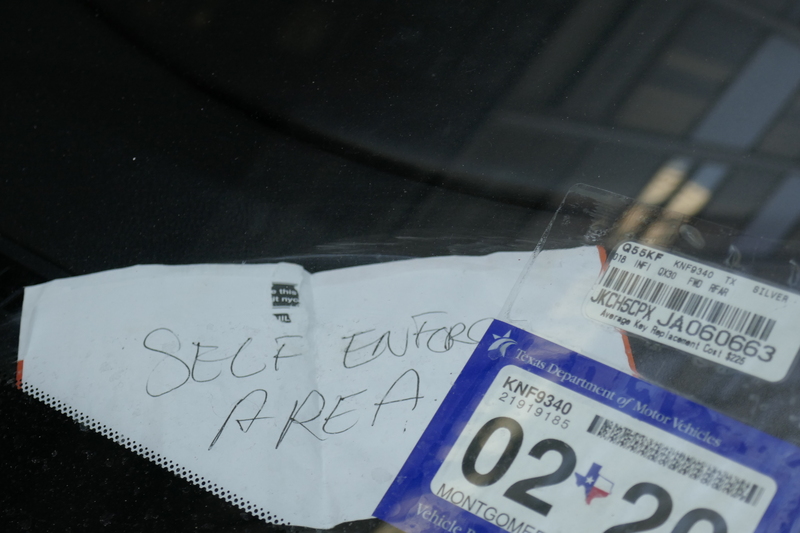 But go a few blocks away, and the hospital placards are in the windshield of cars parked in bus lanes. There are Police Surgeon placards all over the place. But traffic agents have told me they have been ordered not to give tickets to any MD plates, hospital placards, or police surgeon placards within 5 or so blocks of the hospital. Worse, the precinct near my home, the police cars and the officer’s personal cars are triple parked. But they never ever park on the sidewalk. If they did, they couldn’t drive on it to get the car that was blocked in by two other rows out! So, if the mayor follows through on his proposals, maybe we will see a difference. But if everyone actually used their placards the way they are supposed to be used, there would be a huge difference. That’s the whole problem with placards. There is nothing to stop placard owners from abusing them, because as you say even when the issue of fake placards and placards on the wrong vehicle is solved, abusers will still use them outside of work. It’s as if they believe “their car” has been granted a special 24/7 privilege to go where it likes. The ONLY solution to placard abuse is to ban placards. We don’t need them. The only placards we should see in this city are disabled ones (and even they’re open to abuse – we need to start handing out jail sentences for abusers). I tried to get a handicap placard, and I am legitimately handicapped. It is particularly annoying because my neighbor has one that actually belongs to his mother but is registered to his car and he is NOT handicap. They told me to try again in another year. What a joke. If you know a doctor that will really pour it on thick for you in your application you are set, otherwise, too bad. One thing you could do with an automated system–obviously not saying the city is looking into anything like this–is create some mechanism where the placard has to be activated each time it’s used. (Maybe an app some sort.) If not activated, it’s invisible to the automated plate readers. And you make it so it can only be activated by a city employee on the clock so that to use it for personal time you have to fake your time sheets, which would hopefully give people pause. Again, the city is clearly NOT interested in cracking down on placard misuse, but if it was, I could imagine all sorts of technical measures that really would help with the problem of misuse of legit placards (and I’m sure people smarter than me would have even better ideas). “We will purchase parking lots, we will lease parking lots, parking garages — whatever it takes …” so that there is even less affordable housing in this city and more space for cars! Then cops, firefighters, and teachers will have to live even farther from the city and rely on cars even more, and ask for more parking spaces, etc etc. Thank you Mr. Mayor for leaving your successor an even bigger mess to clean up than they already had. Between this, the e-bike/general policing of cyclists debacle, your pandering to unions, and your general fiscal irresponsibility, it’s going to take at least a generation to fix things, probably a lot longer. You’re a disgrace, Mr. Mayor. If you had any good sense you would resign now. In fact, average NYPD salaries are far higher than those of other civil servants, plus they get to retire with pension far sooner (22 years). Why should taxpayers pay for people who abuse the placards? Mostly all of them do especially the cops. They do not treat citizens right. They want respect. THEY MUST GIVE RESPECT. All the cops should go for training in how to treat the citizens. Mostly the placards are used and abused. They are road rage city workers as well. Blasio does not do NOTHING for this city to make it a better city. We need a mayor that will crack down on all this use and abuse. He is a scaredy cat . He is afraid to speak up for what he should.